The story of Salty – the Friendliest Shark by the Sea! It was a warm summer night with a full moon above and Salty was lazily swimming in the ocean. He had not a worry in the world when all of a sudden a red glow caught his eye. He wondered what it could be, so he decided to swim a little closer. He poked his head out just above the wave and to his amazement there was a celebration happening on shore. Being very curious, Salty made his way out of the water onto the beach to see what it was. It was the Fire and Luau show! Salty decided to stay and play at this fabulous oceanfront resort. He danced in the hula show, floated around the lazy river, played in the pirate boat and even bowled a few games. WOW!! There was so much to do at CQ!! After such an enjoyable night he knew he had to go back home, but not before letting his new friends at Captain’s Quarters know how much fun he had. He could barely wait to tell his friends Tiki the bird and Sharkee the shark about his new adventure. On his next visit, Salty was going to bring his friends for a marvelous parade, magic shows galore and LOTS of playing, playing, playing in the sun, sun, sun!! 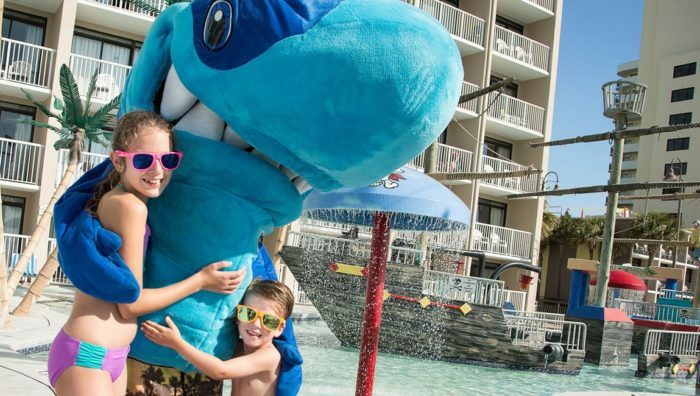 The friendliest shark by the sea had found his new destination of choice for Fun in the Sun!! Salty invites you to come and join in on the excitement too!! See you real soon! !